The FIFA Football World Cup 2014 Brazil is currently under way at full swing with exciting matches and some unexpected results. The biggest disappointment so far is that the previous champion Spain has already bowed out of the tournament. If you are a football fan and all this action has caught upto you late, do not worry. The FIFA Football World Cup 2014 tickets are still available on sale online, and you can grab one right now if you plan on visiting a stadium for the match. FIFA has originally sold the football world cup tickets in two phases dating from 20/08/2013 to 28/11/2013 and 08/12/13 to 01/04/14. There was also a last minute sales phase dating from 15/04/14 to 13/07/14. So, anyone unable to purchase the FIFA Football World Cup 2014 match tickets during the first two phases can still book them at various websites. If you are game enough, tickets for the FIFA Football World Cup 2014 final match on 13/07/2014 are also available. 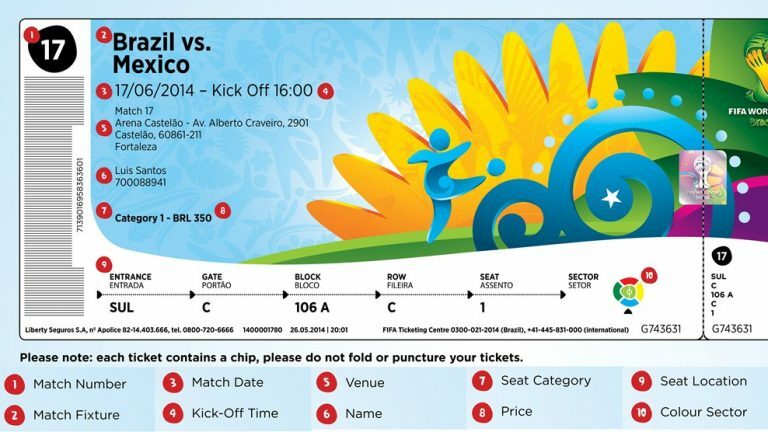 The final match tickets cost a bomb and will make you poorer by as much as $15,000. If you are just looking for the thrill of watching a world cup match in the stadium, you can buy tickets for a few tens of dollars. Of course, the ticket prices vary with the teams involved. Matches involving smaller teams command lower ticket prices while the matches involving bigger teams like Brazil, France, England etc. typically run into hundreds of dollars. 1. viagogo: viagogo is the world’s largest online ticket marketplace and you can buy your FIFA Football World Cup 2014 tickets with confidence at viagogo. Apart from FIFA Football World Cup 2014 tickets, viagogo also sells ticket for concerts, festivals, theater and other sports. 2. livefootballtickets: livefootballtickets is your online ticket booking destination for all things football. This website is exclusively dedicated to football tickets and you can find tickets for all the major football leagues and cups. 3. ticketnetwork: You can book your FIFA Football World Cup 2014 match tickets as well as tickets to other sporting events, concerts and theater at the ticketnetwork website. You can also view citywide events for all major cities in the United States. 4. vividseats: If you are a big fan of the US national sports leagues like NFL, NBA, MLB, NHL, NCAA etc. vividseats website is a must visit for your ticket booking needs. The FIFA Football World Cup 2014 Brazil tickets are also on sale at vividseats. If you are interested in watching live FIFA Football World Cup 2014 matches at the stadium, the above websites are good choice to book your football world cup tickets at. We hope you have a wonderful time watching the biggest sporting event of 2014.